Mezzo Lunatico: past, present, and future. 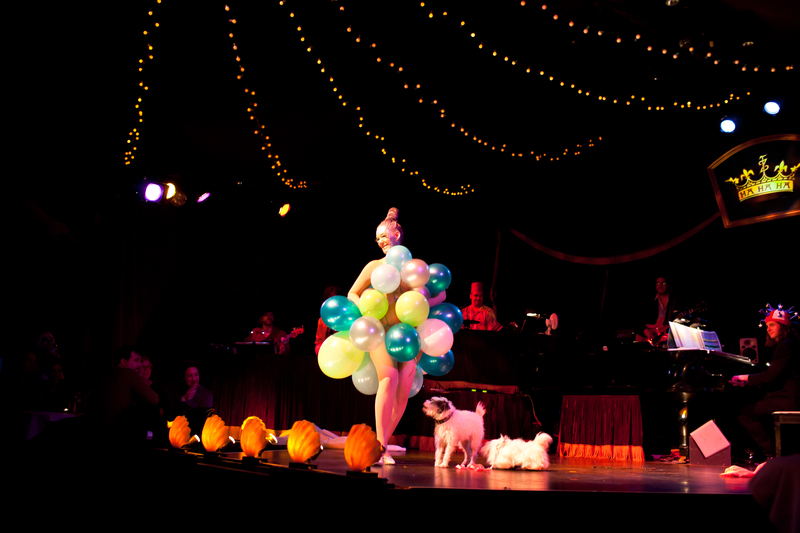 Teatro ZinZanni is sensory candy for those that like a little provocation to accompany dinner. 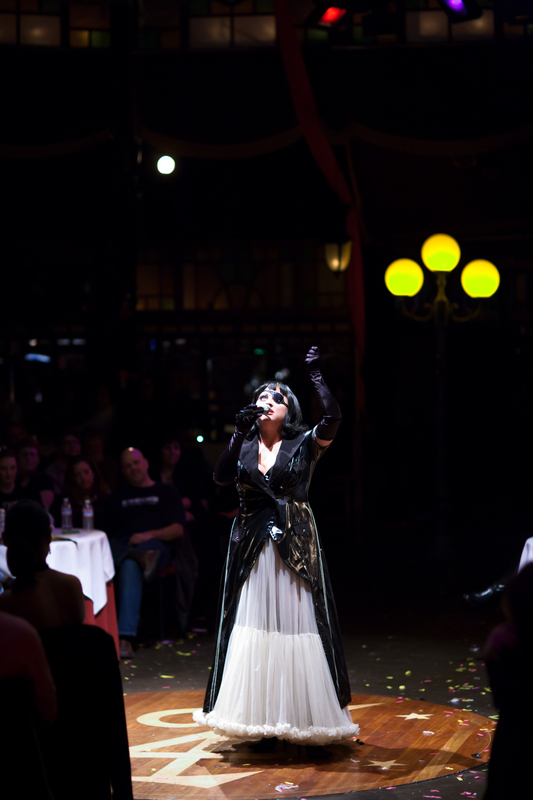 The European-inspired cabaret exists only in San Francisco and Seattle, making it practically a national treasure. 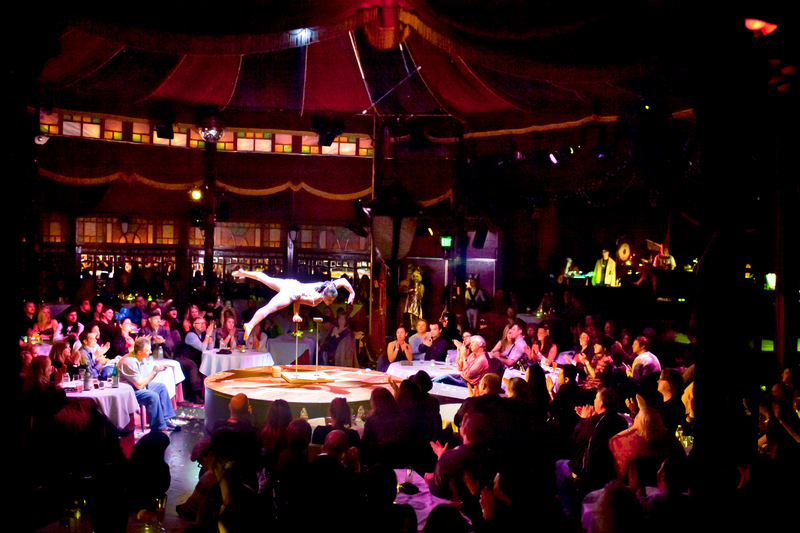 The shows are housed in antique Belgian spiegeltents (think a big top with a disco ball), of which only eight remain in existence and two of those belong to ZinZanni: “Les Palis Nostalgique” in San Fran, and “Moulin Rouge” on loan in Seattle. 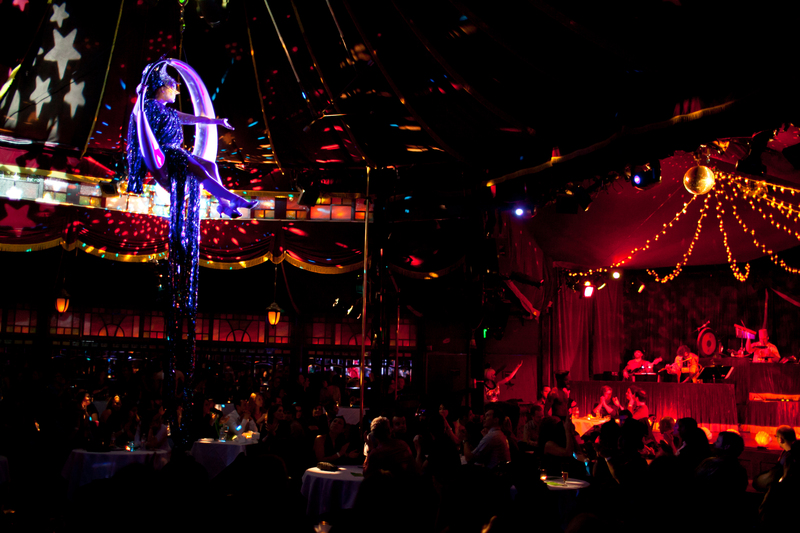 ZinZanni has always flirted with the risque, perhaps erring on the lighter side of scandalous for the less broken in dinner crowds. But with the newer late night varieté Mezzo Lunatico, the show is later, the tickets more affordable, the acrobatics more dizzying, and the skin more…discoverable. For the last quarter of 2010, Mezzo was curated by the incorrigible El Vez, who hosted Catherine D’Lish, Scotty the Blue Bunny, the Luminous Pariah, and Manuela Horn. At the moment The Swedish Housewife is having her way with Mezzo, and for her second of three productions she is joined by Poppy Daze (founder of the original aerial girl gang The Aerialistas) plus Lily Verlaine, Cherdonna and Lou, and Mark Pickerel. The music and mayhem continue Saturday, February 19th: Doors are at 11pm, Show is 11:45pm to 1:45am. Tickets are $25, and can be found HERE. Arrive early, these shows sell out fast. 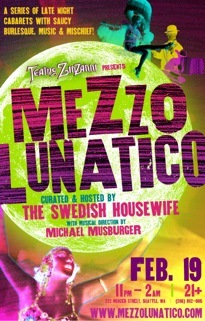 Mezzo is hosted by The Swedish Housewife Feb 19 and March 19. ~ by angrytruffle on 02/11/2011.